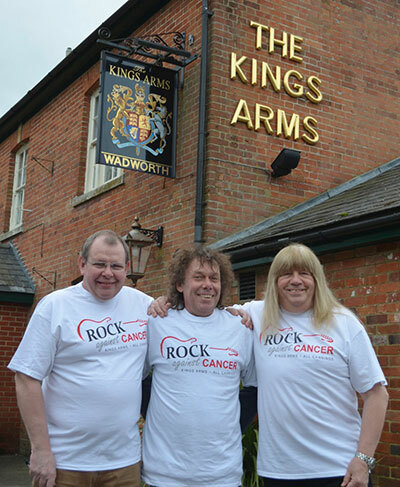 “Rock Against Cancer” was an idea thought up by John “Grubby” Callis (sound engineer) Andy Scott (Sweet) and Richard Baulu of The Kings Arms, All Cannings in 2010, and after 2 years of planning we managed to launch the show back in 2012. Our aim is to raise awareness and much needed funds for Cancer Charities and exceed the £50,000 target we set ourselves back in 2010. And also to make a large donation to local needs in and around All Cannings and the hope is that in the future they will be able to put different events on for local residents. The last five years’ success was fantastic and we’ve managed to raise over £152,500 for the charities so far – thanks to you all and the wonderful support of the artists that came to the sleepy village of All Cannings. If you were lucky enough to go to one, or really fortunate and got to go to all of the previous concerts, you’ll know what an exceptional event Concert at the Kings is. We have been privileged to have had some of the finest musicians join us, many of whom have truly shaped the course of music over the years. Not many events can boast this many headline acts from the previous three years: Brian May, Roger Taylor, Jeff Beck, The Boomtown Rats, Squeeze, Lindisfarne, Howard Jones, Mike and the Mechanics, Midge Ure, 10CC, The SAS Band with special guests, The Straits, Steve Harley and Cockney Rebel, Big Country, Los Pacaminos with Paul Young, The Sweet, Patti Russo, Suzi Quatro, Kerry Ellis, Animals and Friends, Benny Gallagher, Chris Thompson, Marmalade, The Fabbagirls, Kiki Dee, Madeline Bell, Fish, Tom Robinson, The Queen Extravaganza’s Marc Martel, Dr Feelgood, The Blues Band, Georgie Fame, Dozy, Beaky, Mick and Tich, The Strawbs, The Troggs, Jake Meekin, The Greasy Slicks, Funkin Skunks, Bad Sounds, Drench, Idlewood, Lauren Thalia, and Nellie Bell. Hosted by Bob Harris, Johnnie Walker, Mike Read and Dan Chisholm – and all playing on hot, sunny days in a small village in Wiltshire. 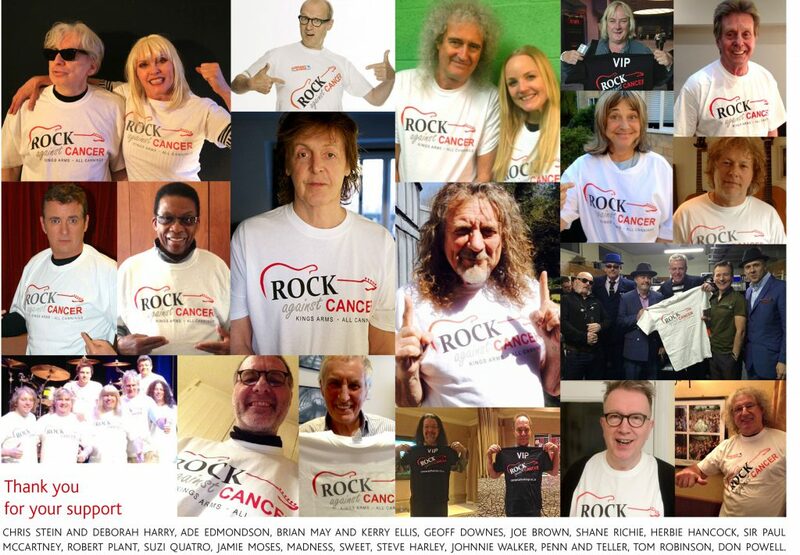 By purchasing a ticket to “Concert At The Kings” you are already making a donation to cancer charities and a big thanks to everyone who has shown their support by doing this. By purchasing any merchandise, food, drink and other items that will be available at the event, will also add to what we can donate to the charities and the area’s schools, churches and many more local causes. John “Grubby” Callis and Andy Scott are still in the process of fighting prostate cancer so they both know more than most about how important this is to us all and to raise as much awareness as possible, We can make a change so please come and join us on another fantastic star-studded day. A huge thanks to everyone who is supporting this event both near (All Cannings) and far (Scotland). You know who you are and Grubby, Andy and Richard hope to raise a glass in your honour come the big day. Grubby x, Richard and Andy.